Smell the Jasmin and enjoy the tranquillity. Get to know the Spanish temperament, the rich culture and amazing nature of Andalucía from our stylish accommodation. Welcome to Villa CONMIGO bed & breakfast. 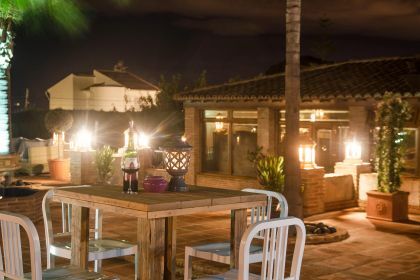 Situated in a peaceful villa area in the Spanish village Alhaurín de la Torre, just 25 minutes away from Málaga and the airport, we offer our guests three stylish rooms and two luxury suites for a wonderful, comfortable and luxury stay. 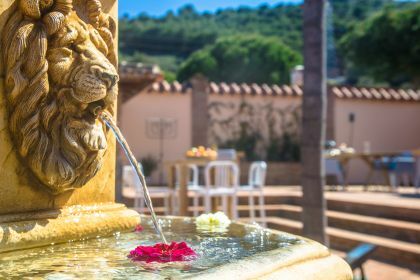 Come and enjoy our hospitality, the versatile Andalucía and the enjoyable climate. We love to share our passion for Spain with you. Meet us and read our story, we are Dennis & Edwin. 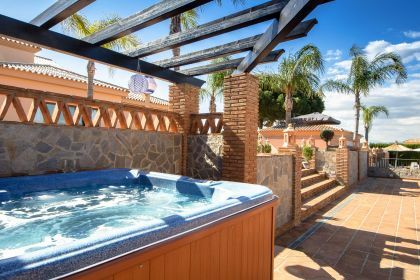 Feel the warmth of the Spanish sun on the Villa CONMIGO sun terrace, take a refreshing swim in the large swimming pool (5,5m x 11,5m) or enjoy the Jacuzzi whilst zipping a cold drink. 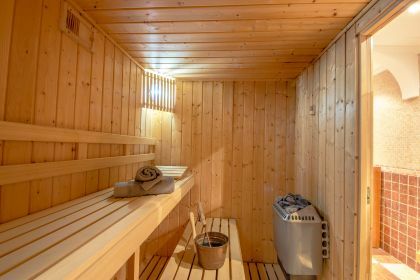 Simmer down in the Finnish sauna*, unwind and enjoy a wonderful professional massage* or challenge yourself in our fitness area. Share your experiences with other guests in our welcoming lounge or at the outdoor bar and for our peace seekers there is always a quiet place on our 2500m2 outside area. When the weather gets chilly it is just wonderful to linger around in the spacious living room with open fireplace or at the large dining room table. * Using the Finnish sauna or professional massage is not included in the room rate. Download the leaflet with information about our wellness and professional massages including rates. We enjoy offering our guests the highest comfort and personal service. It is our pleasure to give you tips and information about sightseeing´s and the area. Our bookcase is stacked with inspiring books, leaflets and maps about Spain, Andalucía and Alhaurín de la Torre. It is also our pleasure to book your reservations for your entrance tickets, a table in a restaurant or arrange your green fees. And it goes without saying that Villa CONMIGO is well equipped with good free WiFi. We enjoy spoiling our guests with beautiful Spanish products and international dishes. Our honesty-bar is at your disposal at all times for any drinks or snacks, which includes a beautiful selection of wines, sherry´s and Nespresso coffee. Start of the day with a wonderful delicious breakfast which is served at our breakfast terrace. For your afternoon appetite we provide a small lunch menu and a few times a week we serve dinner*, a BBQ* or an authentic Spanish Paella*. On other nights we offer an extensive tray with tapas* with lots of delicacies from Andalucía or invite yourself to visit one of the 60 restaurants in Alhaurín de la Torre. From traditional Spanish tapas to international dining; the village offers something for everyone. * No lunch, tapas and dinner service on sunday. The Costa del Sol is also called 'Costa del Golf'. A well-chosen name as there are dozens of excellent golf courses, one for everyone’s budget and level. In the Málaga area there are more than 40 and in just 10 minutes from our bed & breakfast you will find Lauro Golf, designed by Folco Nardi, with its 27 holes golf course that can be played in three different combinations, all par 72. We have contracts with several golf courses in the area and can offer green fees at a discount. We are more than happy to reserve your green fees, help you with a tailor-made program or your complete golf holiday. We also offer a 2, 3 and 4 green fee combi package as well as a weekend and week package including accommodation in our bed and breakfast. Contact us for more information, rates and reservations or download the information below.